Some critics have suggested that the dazzling intellectual display in Stoppard's plays comes at the expense of genuine emotional engagement. We are amused, intrigued, even educated but we do not feel any real sympathy for his characters. How far do you find this true of Arcadia? The first thing we notice about this play is its intellectual brilliance. The characters are amusing and we are interested in how they relate to each other. As the play goes on, however, we do not find it easy to care about most of Stoppard's characters. 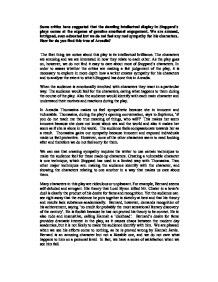 In order to assess whether the critics are making a fair judgement of the play, it is necessary to explore in more depth how a writer creates sympathy for his characters and to analyse the extent to which Stoppard has done this in Arcadia. 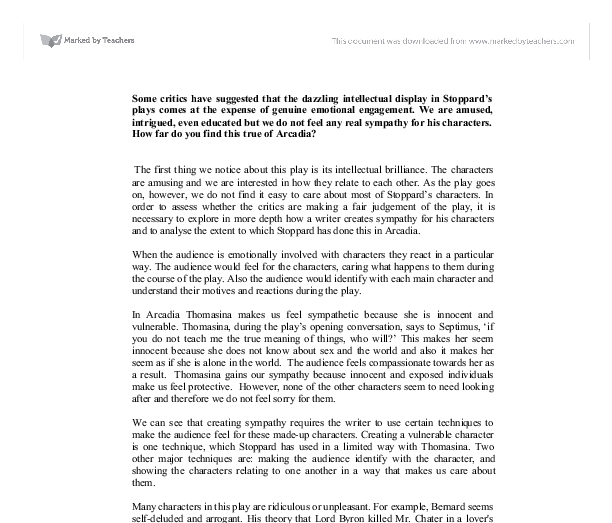 When the audience is emotionally involved with characters they react in a particular way. The audience would feel for the characters, caring what happens to them during the course of the play. Also the audience would identify with each main character and understand their motives and reactions during the play. ...read more. He is also rude and insensitive, calling Hannah a 'dickhead'. Bernard's desire for fame provides dramatic interest in the play, as it causes chaos between the modern day academics, but it is not likely to make the audience identify with him. We are pleased when we see his efforts come to nothing, as he is proved wrong by Hannah Jarvis. Bernard is an amusing character but not a likeable one, and we do not care what happens to him on a personal level. In fact, we have a sense of satisfaction when we see him fail. Another character that does not invite audience sympathy is Lady Croom, the dominant battle-axe who storms around the estate. For instance, in the first scene, when the members of the house come together to hear Mr Noakes' plan for the garden, Lady Croom's unpleasant nature come across. Noakes is never allowed to start, let alone finish, his presentation because Lady Croom persistently cuts in. Every time she says 'Mr Noakes, back to you' or Mr Noakes- now at last it is your turn' she then cuts in on him and disapproves of him before he completes a whole sentence. ...read more. Bernard constantly takes the opportunity to insult Hannah's academic status: Bernard: You've never understood him, as you've shown in your novelette. Here, he refers to Hannah's book as a 'novelette', implying that it is a trivial work of no importance. This is characteristic of the way he talks to her. Hannah is slightly more sympathetic than Bernard, but she also participates in the spiteful conversations that the academics have between them. Thus we rarely see genuine caring interaction so this makes it hard to care about the characters. The only relationship in the play that does make us feel something for the characters involved is the one between Thomasina and Septimus. It is clear that he genuinely cares about her, and at the end, when they dance together, there is a sense of connection which makes the audience feel an emotional response. I think the great achievements of this play must be considered intellectual rather than emotional. Stoppard keeps the audience amused with witty conversation, irony and playful use of language. The audience enjoys this and gets intellectual satisfaction from admiring Stoppard's cleverness. The knowledge he displays will appeal to the well-educated person in the audience able to appreciate the skill with which he manipulates ideas and concepts. ...read more. War is represents a form of sterility and infertility in the play, as its end means is not beneficial and brings about no advantage for the people in the society. A valid quote to justify such an opinion is "At last! They are indifferent to the death of another jumper. * They are "not as young" as it would be expected showing too how their concepts already is an ageing mentality which is loosing power. Phrases like the one quoted above make the story seem as if it being read out to an audience by a narrator, stories that are normally read by a narrator are normally aimed at a younger audience who find reading hard and prefer to have stories read to them. Bolt also shows that More cannot be questioned by the Archbishop either; "Some men think the Earth is round, ..." says More when Cranmer tries to make him sign. This is a moral standing, and it appears More has an answer to everything. Derek's companions proceed to break into a nearby shed while he "relieves himself" against a tree outside. This distances him from the action, separating him from the other troublesome youths. Derek is shouted from within and told to join them. In this case it can be said that there really is no underlying design for the surface brilliance to inhibit, the game is purely fun for the audience. This is a recurring feature in the play. For example; on one occasion Thomasina and Septimus are having what seems to be an eloquent conversation about Cleopatra. How blacks had created white, the white earth portrayed evil and all things intoxicating. These powerful points alienated these racist views, and brought another possible idea to the beginning of the world, time and existence. In the "Jongleur" the audience is made clear the power Jesus has in this play. More: The wine please, Matthew? Is it good? Steward: 'Bless you sir! I don't know!' More: (mildly) 'Bless you too Matthew. Matthew's dishonesty is quite humorous, as there is no need to lie: as a steward he would be expected to taste the wine.